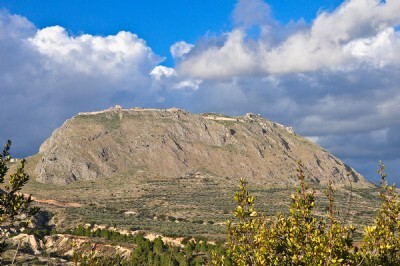 The “Acrocorinth” is the acropolis (citadel) of Corinth. It is situated to the southwest of the ancient city and rises to an elevation of 1883 ft. [574 m.]. Today it is surrounded by walls that are about 1.85 mi. [3 km.] long. The foundations of the fortifications are ancient—going back to the Hellenistic Period. The current walls were built and rebuilt by the Byzantines, Franks, Venetians, and Ottoman Turks. The entrance to the Acrocorinth is from the west where the approach is most gentle.